The food and beverage industry often requires both direct and indirect contact of compressed air with the final product or with products in the food chain. Therefore, it is important for food processors to reduce the risk of microorganism growth in their compressed air installation to ensure food safety. Alternately, when temperatures reach below 18°C/64°F, microorganism growth decreases and nearly ceases when temperatures reach the freezing point of water. Studies have indicated that the growth of microorganisms, such as fungus and bacteria, completely cease when temperatures reach < -18°C/0°F. Different types of fungus or bacteria require different amounts of water (in vapor form) to reproduce and grow. The majority require relative humidity (RH) of 60 percent or more, though some can survive and multiply in >20 percent RH. Thus, decreasing temperature and moisture (relative humidity), creates a less hospitable environment for microorganisms to grow. For example, if compressed air is at a Pressure Dew Point of -30°C/-22°F and the outside temperature during winter decreases to -18°C/0°F, there is a possibility of 32% RH in the pipeline. In principle, this scenario represents a possible danger zone regarding the RH; however, the temperature is far below the freezing point of water, making the temperature too low for microorganism growth. In some cases, once the ambient temperature rises the RH will consequently decrease and keeps as such the air below the viable and attractive atmospheric conditions for microorganism growth. Pressure dew point also means the water content is under pressurized conditions. If the air comes into contact with the product after expansion, which is applicable in most cases, the dew point, or relative humidity, will be significantly lower. The most energy efficient solution to combat microorganism growth is a heat of compression rotary drum dryer where the dew point is variable during different running conditions. The PDP is related to the cooling water temperature in the case of water-cooled compressors, and related to the ambient air temperature in the case of air-cooled compressors. For a heat of compression rotary drum dryer, the PDP is approximately 50K below the cooling medium. With a heat of compression rotary drum dryer, relative humidity becomes more or less stable and is reduced to 3 percent (or even as low as < 1 percent). In most conditions, a RH of 3 percent is too low to create an atmosphere where the microorganisms can grow. Heat of compression dryers are highly energy efficient and ensure the required level of extremely dry, high quality air. In fact, energy consumption from a heat of compression dryer represents less than 1 percent of the compressor’s power. 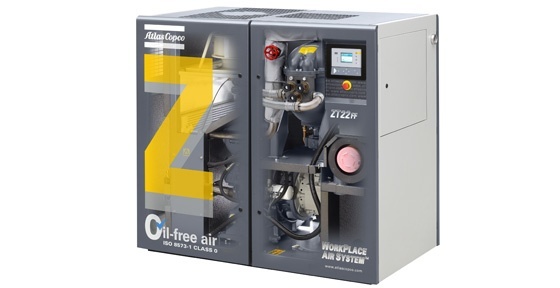 If you’d like to learn more about Atlas Copco’s heat of compression dryers, contact us by filling out our Request a Quote form and a representative will be in touch with you shortly.